When I was a kid growing up in the woods, critters were a part of our family. Seems like we’d always come home with something that we thought we could save or raise as a pet. Unfortunately, most of the injured or orphaned animals we found, died in our care. Here are seven guideline for what to do if you come across an animal in distress. First off, remember that nature knows better than we do. Often, people come across young animals that appear to be orphaned and decide they need to save them. Mothers often leave their babies alone for up to six hours. Unless you know for sure that mom is dead or the babies are in immediate danger (on the highway for example), it’s better to leave them alone. Mom won’t come and reclaim her babies with people around so they stand a better chance at survival if you quietly leave the area. Most people think that when baby birds fall out of their nest, their mom will reject them. That’s simply not true and you can actually put them back in the nest. Sometimes bird nests with eggs fall out of trees. You can put the nest back in the same tree (try for the same spot) and mom will usually come back. If you find injured animals such as birds striking windows, cat or dog caught animals or animals hit on roads, they should be handled very carefully. For small animals and birds, a paper bag or cardboard box is the best. line the bottom with a towel for warmth and keep good ventilation. Do not attempt to give food or water to wildlife, it can be fatal for them. Also remember that injured animals will bite you. A raven can break a finger and some animals carry rabies. It is best to use gloves or a blanket/towel. Once you cover their head, they will feel safe. Be careful not to make loud noises and keep children and pets away. Stress will kill them as quick as anything. There are wildlife rescue resources all over. Where I volunteer, there is a raptor team, a songbird team and a small mammal team and all of us are trained and dedicated to rescue and rehabilitation of wildlife. Many of these animals and birds recover and are released back into their environment and some are humanely euthanized. Most wildlife is illegal to possess and often well-intentioned folks try to make them pets. The Marine Mammal Protection Act prohibits anyone from assisting marine mammals who isn’t certified by the federal government. Wildlife needs to have as little human contact as possible in order to survive back in the wild. 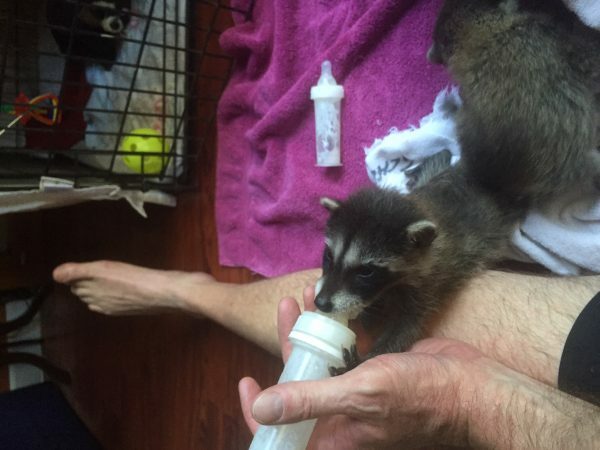 Photo credit: Two of the three orphaned raccoon babies that I am rehabilitating in my home.